beach access with showers and bathrooms! king-size bed, and cable TV/DVD. Second bedroom has beds for 4- a twin over full bunk and another twin bed. We now have wireless DSL internet! Spent Spring Break in Madeira Beach. We had an amazing time with our 2 boys 8 and 3. The condo was VERY spacious. We had a couple things go wrong.. shower didn't work in the bathroom and toilet broke. Kim tried to fix it for us with a plumber but we didn't want to wait around so we just dealt with it. It was a minor inconvenience really. Kim was very accommodating and helpful. The location is absolutely perfect! We will definitely be back. Location and price was amazing. Nice condo, convenient to restaurants and shopping. Across from the beach. Our second time to stay in the condo. Will stay again. The location and condo is perfect for anyone wanting to enjoy the left coast. The condo has everything needed for a week or month stay. Owner and support staff were very helpful from start to finish. My wife and I plan to make this one of our preferred VRBO condos for future trips to the area. This was our first time staying here and it won't be out last. My wife, four kids, and myself were a little worried about the size of the place when we booked. 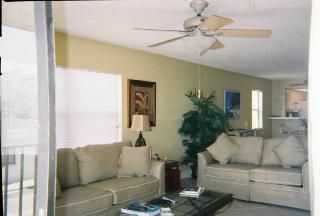 However, we were pleasantly surprised how big the place was, with the living room, dining, and kitchen areas having an open floor plan. The location is great, literally steps from the beautiful ocean and beach. Great view from the larger than expected balcony.Very close to great resteraunts, shops, and ice cream parlors. My only two minor complaints were, the living room furniture needs to be updated and the masterbath showerhead needed to be cleaned, due to mildew buildup. Overall a great place to stay and we couldn't have had a better more relaxing time than we did staying here. Pets under 20 lbs are allowed. Rates are subject to change until booking is made.